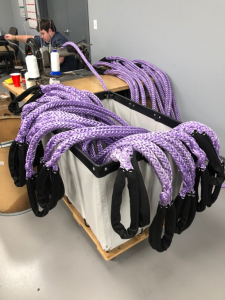 High Modulus Polyethylene (HMPE) synthetic rope is gaining in popularity and Fulcrum Lifting is pleased to be doing more and more in-house fabrication. 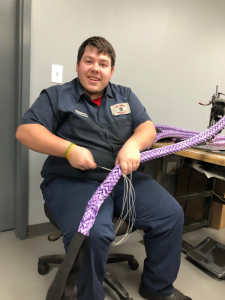 Austin Doppes (Tri-State Wire Rope branch, Cincinnati) recently completed a large project splicing 7/8” Cortland Rope into slings. The working load limit was 18,500lbs per sling and test-broke at over 107,000lbs. Great job Austin! In addition to being a fraction of the weight of wire rope, the rope is much safer in towing applications as it naturally absorbs much of the shock if the sling happens to break under load.